We are readers. Nerdy Girl had a bookcase in her room before she was born. She’s now up to three bookcases. All full. I don’t even want to admit how many bookcases we have in the house. It’s embarrassing. But cleaning out the garage the other day, I came across a box of stuff that moved from our old house without checking the contents. I found several books I bought in the late 90s, but never read. I think I probably have a few more titles in those too-numerous-to-reveal bookcases. I suspect a theme here. And I’m still a dummy, but I think maybe those finance books need to be replaced with 2011 revisions. I might pick up the 7 Habits book, but today, I’m writing. Do you have any books you’ve never read? We all like free stuff. But aren’t you a little bit skeptical when someone wants to give you something for nothing? I am. I do like bonuses. I pay for my TV/broadband service. That includes Video-On-Demand. Gotta love it. That includes ExerciseTV. Woohoo! All those workout videos you can buy? FREE! I chose Leslie Sansone’s Start Walking Program. Twenty minutes. Zero impact. No equipment. No athletic ability/coordination required. 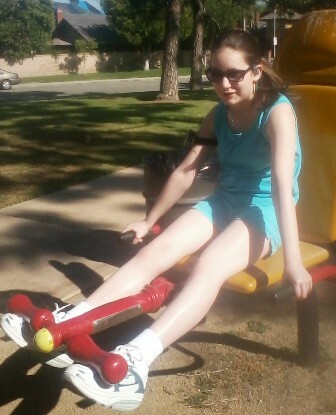 After getting Nerdy Girl to join me and a few weeks of walking in our living room, we headed outdoors. One destination yielded another bonus. 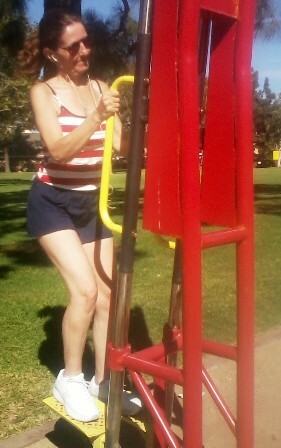 Outdoor fitness equipment at a nearby park. Designed to use bodyweight for resistance, it’s like going to the gym only better. It’s FREE! We get to be outside, get cardio workout by walking, vitamin D and a little color from the sun, and muscle-toning workout at the park. Any really FREE stuff in your world? In the beginning, was the Nerd. Are you ready? Everybody is blogging about something. The problem with nerdism is that we nerds have so many interests. We’re fascinated by the world and make new discoveries every day. Join mother and daughter nerds on a fascinating adventure into diversity.